By the end of this year, there should be 15,000 Chevy Volts and Opel Amperas on the road, and hydrogen-powered vehicles aren’t far behind. Where to power up all those electric cars? Britta Gross is working on the solution. Britta Gross is a big picture thinker. That’s a good thing, because she’s the one heading up a division of General Motors which is developing the infrastructure to support alternatively-fueled vehicles. Consider: by the end of 2011, GM says it will build 15,000 Chevrolet Volts and Opel Amperas for global distribution. Though they’re not commercially available yet, hydrogen fuel cell cars will be added to the mix before long. Fuel Cells 2000 estimates that there are more than 630 active companies and laboratories in 47 states involved in the fuel cell and related fuels industry, investing an estimated $1 billion a year. That’s a heck of a lot of batteries and fuel cells that are going to need charging. 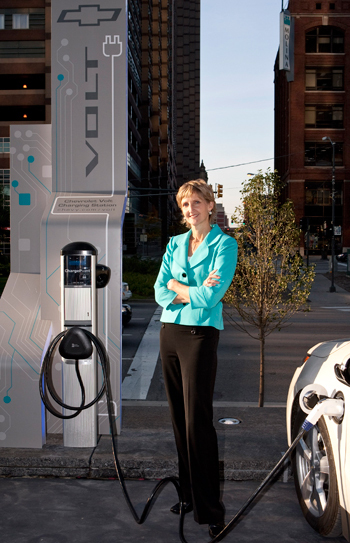 As director, Global Energy Systems and Infrastructure Commercialization for GM, it’s her job to figure out how to keep all those cars humming. But for an engineer who’s been fascinated with problem solving from a young age, it’s just one more piece of a complex global and environmental puzzle she’s eager to tackle. After all, the self-professed mathlete began her career in 1983 with Hughes Space and Communications in Los Angeles, leading mission design and systems engineering teams developing satellite programs. Mere mortals might have spent a career honing those skills. But Gross says rocket science only poses limited challenges. “You only have a few new technologies at any one time,” she tells Fast Company, “With communications systems or stabilization, once you get that right, growth is incremental.” Compared to vehicle design and performance, Gross says there’s no contest. “A vehicle has every complexity and has to change with whim of consumer. The smell, visuals, and sound have to appeal daily for 150,000 miles on the road, she explains. Then engineers must factor in cost effectiveness, energy concerns, and environmental impact. “I was looking for the hardest problems to solve,” she admits, recalling the switch to automotive design. But when she does find fueling infrastructure solutions, Gross says they are going to make a big impact. Some already have. Gross points to the Volt program specifically. “We worked with utilities across North America for four years to make it invisible to the grid and as easy as plugging the car into a regular wall outlet,” she says. To do that she says, it took getting an education in how the grid works so the power of the electric superhighway could be leveraged in small, but significant, ways. Though she admits it’s not easy to predict how fast the fuel cell technology will develop, Gross’s next challenge is hydrogen, which could be here by 2015. “Green electricity is a viable pathway when done with natural gas.” She points out that there are billions of kilograms currently being produced from factories around the country. “The fundamental advantage of hydrogen is that you can go 300 miles on one charge. It really plays to longer trips,” she says. Gross says the fuel cells have come a long way in the past five years in terms refining their chemical composition, but further development will require the support of the federal government. “Automakers can only do so much by themselves,” she maintains. Stimulus funding helped with strategic long-term planning and investment in control electronics, but Gross notes that the U.S. doesn’t have the supply base yet. The good news is that regional efforts to promote hydrogen fuel-cell development are already under way in South Carolina, California, and New York, but the most promising pilot region is Hawaii. Gross envisions the Pacific islands as a kind of Darwinian Galapagos where you could see gas-guzzling vehicles being displaced overnight. It’s perfect she says, because Hawaii is self-contained; cars don’t tend to leave the islands, and the state is so dependent on imported oil for power and vehicles. If all the answers were that simple, alternative vehicles would have already taken over the roads. Gross points out that all-battery vehicles introduce other issues to grid as well as new costs to consumer. “It’s not that one is better. If you believe only one is the panacea you are making a big mistake,” she cautions. Each will be suited to different needs depending on how you use your vehicle. This year, in addition to the Volt, the light-electrification system in the Buick LaCrosse eAssist provides a 25 percent improvement in fuel economy over a traditional gasoline powertrain, she says. Considering biofuels already displace 6 percent of petroleum, that is a big savings. Still she says, “it’s the first part of the solution.” The best strategy is for the consumer to have choices. And she’s working hard to create as many as possible.